This is something I have been meaning to do for some time now - spotlight the customs that appear in the interactive photonovel in their own thread. Now I am not much of a customizer at all, my feeble skills are limited merely to limb-swapping and some crude painting. So here are a few of the characters. More images will follow! Ah, it's good to see these guys in a little more detail! 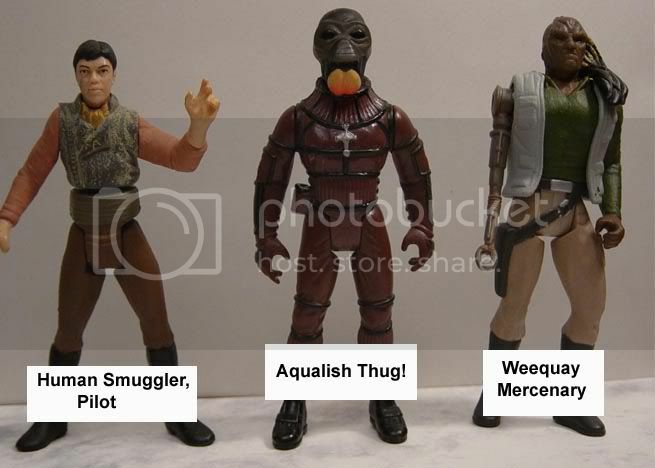 I'm a big fan of that Aqualish thug...I wish I could find some of those Wing Commander figures so I could recreate that guy. Some people might complain about the Trandoshan's feet not being accurate, but I figure they were blown off in a war and he's got cybernetic replacements. For years, that poor Trandoshan was endlessly mocked and ridiculed on his homeworld for having small feet. He ran away from home as soon as he was old enough, traveling the galaxy to hide his shame. 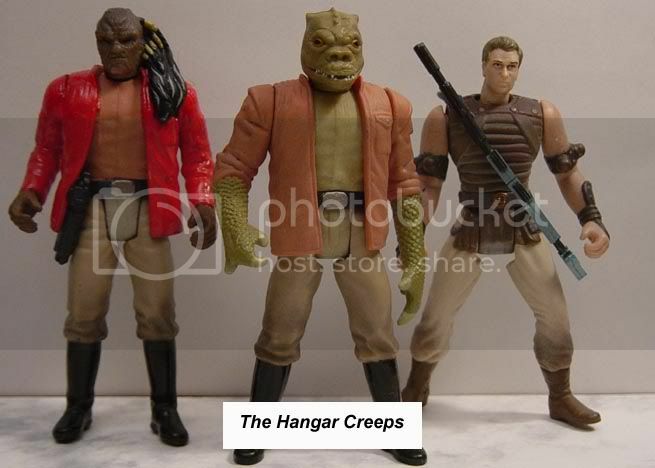 Don't sell yourself short, Lance -- you did a fine job on these. I agree with Delicious, it's great to see these guys close up! Especially Uncle Lance, since we haven't really got to see him up close yet. He looks younger than I thought he was -- what head did you use for him? It's a really cool head. Keep up the great work -- can't wait to see more! Lance is supposed to be around his middle thirties. The head is "Mick" from the "Xyber 9" series. I agree, it's a cool head, though just a tad on the cartoonish side. Yeah, don't sell yourself short at all on these. 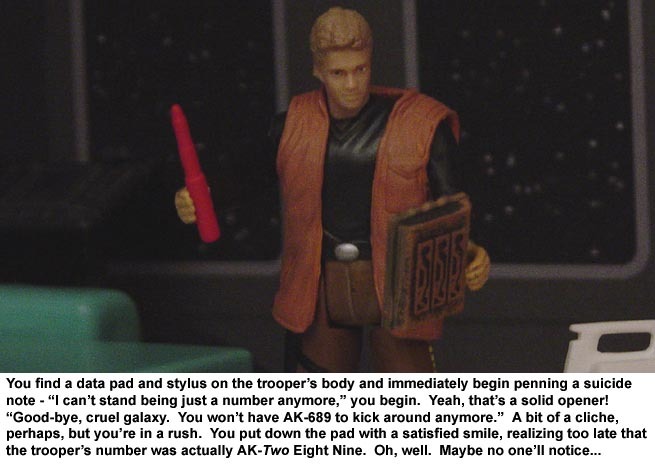 I actually kind of like the more simplistic customs in your photonovel series. They just for some reason seem to fit in perfectly with your dioramas that you make, and the effects you add in. I really think the best one of the bunch is the Trandoshan. It just looks like a real figure that Hasbro made, and not a custom at all. The Weequay is cool too, it was a very inventive custom. Love the mechanical arm, I've been meaning to copy that idea for some time, but haven't gotten around to it just yet. One thing... you know how you use the old POTF2 Fett in the stories. Do you need a VOTC version? I think it would be a good idea for future stories, especially if you want to have Fett more involved because of the articulation. Yeah, I missed the chance to snag a VOTC fett. I actually think the POTF2 version holds up pretty well, though. 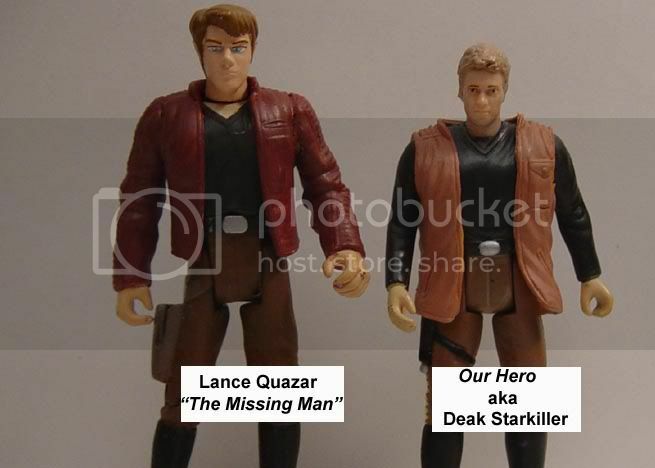 It was a good looking figure and only slightly bulked up, not like the 'roid rage versions of Han and Luke. The articulation is a problem, though. I also have 300th Fett (in case you ever get shot at! ), so I hope it won't be a big problem. I can get you a Fett if you'd like... I'll send you a PM. Don't sell yourself short Lance. These are all pretty good. They are fairly simple but simple customs can be the best. The only way to get better is by practicing. I'd like to see more of your's sometime soon. I have a few more characters to spotlight in the next couple of days. And I hope to make some more in the very near future! Need more characters for the story! My problem is I lack good torsos. I spent months collecting various heads, but have so few bodies...alas. Clever use of parts here Lance. Is that a Grand Admiral Thrawn body or did you paint a Tarkin figure white? Unfortunately I have not yet checked out your photonovels, however after seeing this crazy mix of characters, I think I might have to! 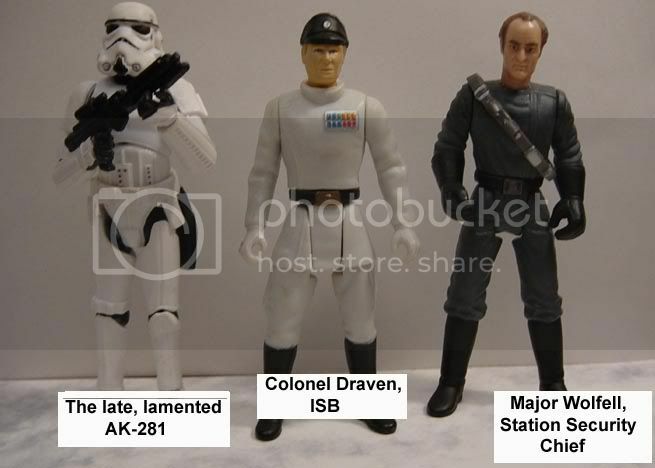 Colonel Draven is a simple custom, made from a Thrawn body and an Imperial technician head. Please check out the story! We're at a critical juncture, locked in a dead heat about which move the hero should take!